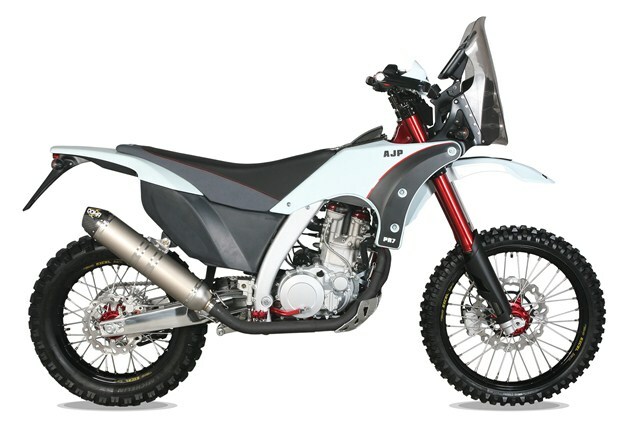 PORTUGUESE off-road manufacturer AJP has just announced its newest model – the PR7, but it won't be available in the UK until September 2016. The PR7 was first shown as a prototype in Cologne last year. AJP describes it as an adventure tourer with an off-road bike at its core. It says this production version is light, compact, agile and comfortable, capable of carrying luggage and covering distance. It’s powered by a 600cc single-cylinder, four-valve, DOHC, liquid-cooled fuel-injected engine made by SWM, not the 658cc single-cylinder Minarelli that was in the prototype. The bike is built around an aluminium and steel frame. At the front is a fully adjustable fork with 300mm of travel. The prototype had a Marzocchi fork and although the spec for this bike lists no further information on the fork, we’re told that it’s likely to be made by Sachs. The piggyback rear shock is also made by Sachs. Stopping at the front is handled by a two-piston caliper and 300mm disc, with the rear getting a single piston caliper and 240mm disc. The fuel tank holds 17 litres and the PR7’s claimed wet weight is 165kg. The price is likely to be around €10,000 when it goes on sale next year.